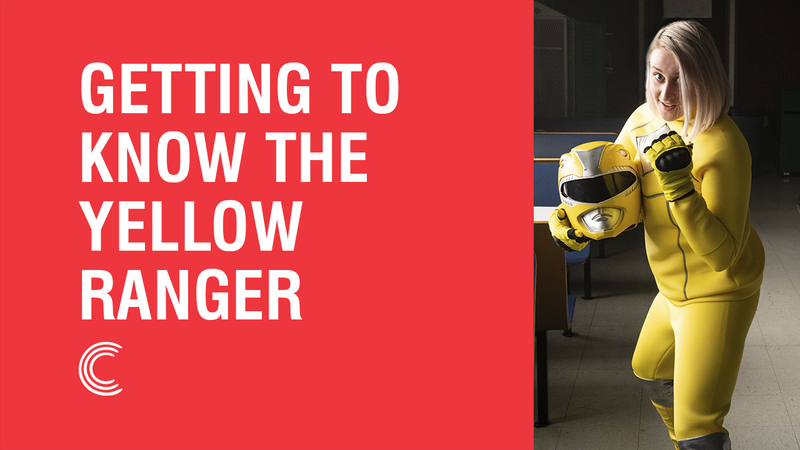 We're excited to introduce you to our good friend, the Yellow Justice Ranger, from Studio C Season 9! Not only can she save the world, but her dance moves are unmatched! Don't miss the exclusive interview below. But first, be sure to watch Susan Weebers', Batman's, Señor Lobster Bisque's, Robert the Artist's, and Prince Charming's interview! Yellow Ranger: My favorite food is the not-cold pizza that they serve on Tuesdays in the lunchroom. Let's talk about it because they have the rectangle pizzas which are pretty great. But then sometimes they have to get Domino's, and I'm like please don't give us Domino's. I want to vomit because it just tastes like garlic cardboard. I'm not here for that. I'm not into it. I will not stand for it. Thank you. Yellow Ranger: Sometimes I like to hang out in banana groves and like, jump out of the trees and freak people out. I'm really good at hiding. As you can see. Also, things I like to do for fun. Sometimes I like to ride my Zord around and jump on people I don't like. It's one of my favorite activities. Yellow Ranger: My dream career is to actually get paid to be a Justice Ranger. Right now, Zordon, like, offered us a scholarship program, but pretty sure that's a lie because I'm working four jobs to try to make it into college and I'm tired. Yellow Ranger: My favorite animal? Not the saber-toothed tiger, contrary to popular belief. They made my Zord a sabertooth. I don't know why. I'm a big fan of seals. Just the big, fat, beautiful animals that leap through the sky into the ocean. [makes seal sounds] It's just… I want that. Yellow Ranger: Ah, my all time favorite movie is "Clueless." Um, I don't know if any of you know, but like there's was this time called the '80s. It was way long ago. Like a long time ago, and people wore a lot of plaid. And there's a girl named Cher-- let me just tell you the whole plot. So Cher is pretty cool. She has lots of friends and she's like really popular in high school, and then it's just like-- it's like this old, old movie called "Emma" that they made like a long time ago. I think they did like four of them. Anyway, it's really good. Yellow Ranger: I'm bad at words. What is just? Now that you've asked me for one word, there is literally not a single word that is not two syllables in my head. Just one word. I can't. I can't think of words. Look, I'm gonna fail my GED. I know that, but… I just can't think of a word. Karate. One word: karate. Yellow Ranger: First thing I do when I wake up is breathe. I'm pretty good at it. I've practiced for a while. And then, I roll over and I wish that I wasn't awake anymore. And then I know that wishes don't come true and this is an evil place called Earth where I have to get up and go to school. And so then, I do, but like 20 minutes late because The Man. You can't be on time for The Man. And then people like question if you're okay and they give you free food. Yellow Ranger: My favorite sketch, uh, is not the leprosy one. It's the one where, where…Oh, this is the Count of Monte Cristo. I'm jealous of you. Well, why are you jealous of me? Because you stink and you have all the things I want and also Fernand and Edmond--Ah, that's right. Fernand. Edmond. Okay. We're gettin' there. Fernand, I don't like you. I'm sorry, Edmond. That's really sad. Well, guess what? Ha! I…I am gonna jump out the window. A simple mistake. Ah! And that's it. Watch her favorite Studio C sketch HERE. BYUtv: What is the worst part of being a superhero? Yellow Ranger: Worst part of being a superhero is like, nobody respects your time. Just say it. It's not okay. I'm like-- I'm just minding my own business. Havin' dinner. Doin' my stuff and then Zordon's like [dialing sounds] Hey, Justice Rangers come and save the people. I'm like, okay, but-- but like dude, do you not know that just 'cause you're stuck in a time warp and your head is a floating mass of nothing, the rest of us have things that we gotta do like six hours of AP Bio. Okay? Which I don't know how I know how I got into AP classes. I don't bio. It's… It's just hard okay? Being seventeen and a hero of the universe. The Justice Rangers are about to find a surprising new ally…find out who it is by watching this Studio C episode! 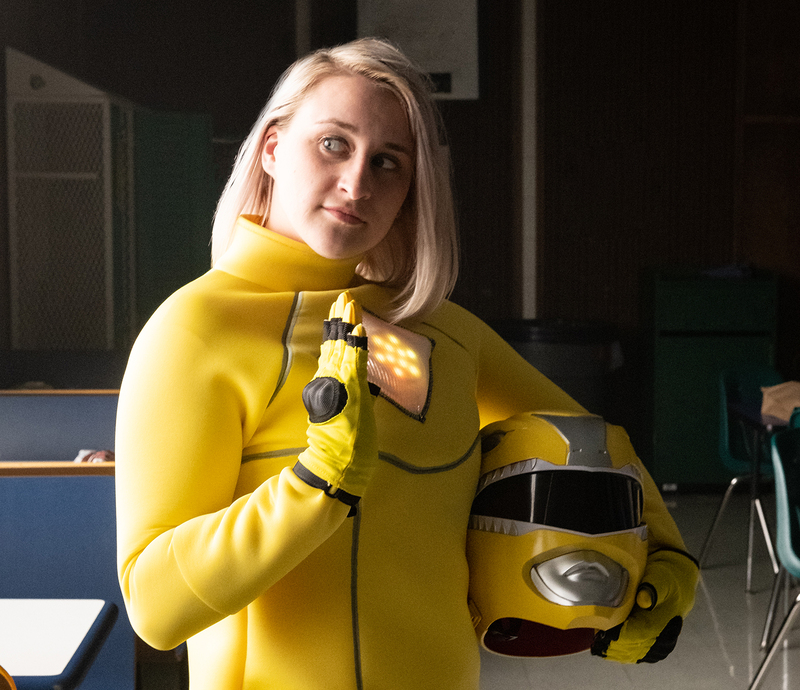 Don't miss the Yellow Justice Ranger (and more of your favorite characters) on Studio C Season 9 airing every Monday night at 7pm MT on BYUtv.